Can you give a solid definition of Product Marketing? Do you understand exactly how it fits into your company and what sets it apart from Product Management? If not, you’re not alone. In this post, Saeed Khan, writer for On Product Management, sets the record straight, explaining the importance behind the distinction and discussing how companies should — and should not — define the Product Marketing role. Anyone who’s worked in a tech startup knows that it’s a “get the job done” environment where your title means little and what you do means a lot. CEOs “hit the streets” and sell. A lot of HR responsibilities are done by individual hiring managers. Everyone answers phones and supports the day-to-day business operations when needed. With the right people, it’s a great experience and everyone pitches in where they can to help the company move forward. In the early days, that kind of “get the job done” environment is necessary in order to cover supporting roles, but the core functions of the company are generally only performed by those trained and skilled in those areas. For example, only Finance manages the books, and only Engineering actually writes the code for the product. And why should it be any other way? Nevertheless, there are typically a few grey areas where roles are not well defined, even though they are important. As a result, the right people are not always assigned to those jobs. Specifically, I’m talking about Product Management and Product Marketing. Unlike functions such as Sales, Engineering, or Finance, where the roles, responsibilities, and outcomes are very well understood (and measurable), Product Management and Product Marketing can’t always make those claims, particularly in early-stage companies. As the company grows, it’s critical to understand these functions and to define and staff these roles appropriately. Doing so will sharpen the focus on the responsibilities and enable scalability for the roles within the organization as it grows. 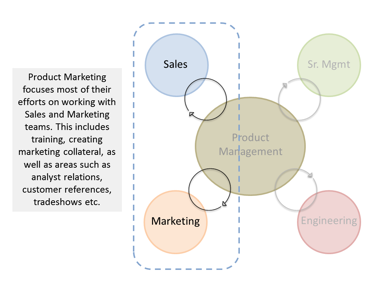 What are Product Management and Product Marketing? First, let me define what Product Management and Product Marketing are. I try to make a clear distinction between each of these two functions below, but please note I’m not claiming that the following are the only precise definitions. Given my experience and understanding of these roles across a number of technology companies, the following definitions are both clear, implementable, and successful in real-world scenarios. Product Management is the comprehensive function in the company that oversees product success over the entire lifecycle of the product. Product Management is responsible for understanding market needs, driving product strategy and plans (that align with company strategy), and ensuring product alignment across company departments and teams (e.g. pricing, channel, and marketing readiness, etc.). In short, it is cross functional business, market, and technical management at the product or product line level. Product Marketing also focuses on understanding the market and market needs, but with an emphasis on understanding the buyer of the company’s products and services. Product Marketing is responsible for developing positioning, messaging, competitive differentiation, and enabling the Sales and Marketing teams to ensure they are aligned and work efficiently to generate and close opportunities. Product Marketing is strategic marketing at the product or product line level. Product Marketing, as an overall function, is in fact a part of the overall function of Product Management. This might not sit well with some people because it seems to imply that Product Marketing is subservient to Product Management, or more personally, that Product Marketers are subservient to Product Managers. But that is not the case. As an example, in a software company, the relationship between Product Management and Product Marketing is similar to the relationship between Engineering and Quality Assurance (QA). Engineering is a function that is responsible for building product that meets functional and quality requirements within a given timeframe. But within the Engineering department, there are usually at least 2 groups – Engineering (or Development) and Quality Assurance. They have different but related roles, and must work together to deliver what is needed. In tiny companies, there may not be a formal QA function and Development will take on both responsibilities, but as the company grows the QA role is defined and staffed accordingly. Likewise for Product Management and Product Marketing — one is a natural (and necessary) specialization of the other. Once you have an understanding of the roles, the questions quickly become, how do we define these functions as the company grows? How should responsibilities be defined and assigned? What are the objectives of these roles? What kind of reporting structure is best? The final question is probably the most important, and also the best place to start. Unfortunately, however, many companies don’t start with objectives and instead focus on simple descriptions of Product Management and Product Marketing. Product Management is “inbound” and Product Marketing is “outbound”. Product Management listens to the market, and Product Marketing speaks to the market. Product Management focuses on putting product “on the shelf,” and Product Marketing focuses on getting product “off the shelf”. 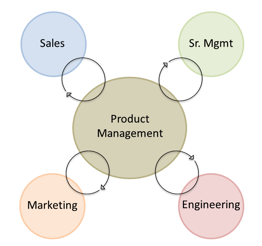 Product Management primarily works with Engineering and Product Marketing primarily works with Sales. This is where a lot of problems begin. All of these are somewhat correct, but they are overly simplistic definitions that don’t really help people understand how to implement these functions properly. Alternatively, some companies also resort to defining the roles by their deliverables (ex: Product Management is responsible for requirements while Product Marketing delivers data sheets, white papers, web content etc.). Again, this can cause problems, as it also serves to separate the two roles and ignore both the strategic nature of the work as well as the need to properly integrate the two. The broad cross-functional nature of the roles can also make them difficult to define. More than any other part of the company, Product Managers and Product Marketers must work across teams — Engineering, Sales, Marketing, Support, Finance, Senior Management — to be effective. That’s why it’s crucial for you to define and incorporate a Product Marketing role into your organization. As mentioned above, Product Marketing is a part of overall Product Management, but with the primary goal of understanding the market and buyer (their needs, alternatives, buying process, etc.) in relation to the company’s products and services. Along with developing an understanding of the buyer, Product Marketing needs to utilize knowledge of the market, product, product strategy, and competition to enable the Marketing and Sales organizations to execute optimally in activities related to the product. From a deliverables perspective, what this usually means is developing documents defining positioning, messaging, competitive differentiation, and go-to-market strategy, and ensuring Senior Management is aligned with these. On a more tactical level, Product Marketing is also usually tasked with working with internal teams to ensure readiness and conducting successful product launches. This includes sales and marketing enablement — i.e. training and educating these teams on the go-to-market, positioning, messaging, differentiation, etc. And finally, particularly in smaller companies, Product Marketing often creates data sheets, white papers, web site copy, and other collateral. I can’t reiterate enough, however, that although this collateral and some of the tactical activities may be the most visible deliverables Product Marketing produces, they are not the primary focus. The strategic work — positioning, messaging, understanding the buyer and market dynamics etc. — is the foundation for virtually all other activities. Once defined, it can support other groups such as corporate marketing in creating consistent, highly effective collateral. For a young company, every new hire is critical. There’s often no shortage of needs to fill, so it’s common that formal product marketing headcount is typically added when a company reaches an inflection point. Unfortunately, that inflection point is usually reached because some person or small team — either product management or marketing — becomes so overloaded they can’t scale. The Product Marketer is then hired to “take some of the load” off that group. This is the wrong way to hire, because immediately the Product Marketer will be defined by the responsibilities and deliverables handed off to him or her by the overloaded team. Instead — going back to the Engineering/QA example — think of Product Marketing as a role to help both Product Management and the company scale. That way, the reason to hire is not simply to reduce the burden of another team, but to bring a better understanding of the buyers and market into the company and optimize how the company markets and sells to those buyers. Over time, as the company grows, introduces more products or product variations, and attacks new use cases, market segments, verticals, or geographies, Product Marketing — as part of overall Product Management — should grow in some reasonable proportion. From that initial hire, the company should grow a team or teams of product marketers, working alongside product managers and aligned to best address strategic and market needs for the company. In today’s market, where technology makes it easy for companies around the world to compete with one another, it is even more important than ever to have a team dedicated to understanding the market and buyer needs, and using that knowledge to ensure the company executes on compelling marketing and sales strategies. Product Marketing talks to and listens to the market. It’s both inbound and outbound, but it exists with a specific focus. By incorporating Product Marketing into Product Management your company is assured full end-to-end alignment — from company and product strategy to product development, product launch, and go-to-market strategy and tactics. And who wouldn’t want that?